Our annual Network business meeting will be on Saturday, May 9, 2015, from 8:45 to 10:15 AM, at the Atlanta Sheraton Downtown Hotel (165 Courtland Street NE, Atlanta, GA 30303), as part of the ACPE national conference. Please send any agenda items to john.ehman@uphs.upenn.edu. This will be a time to share projects and interests, discuss how to promote research in the ACPE, and accomplish essential business. The 2015 recipient of the Critical Thinking in Research and Innovation Award, to be presented at the national conference in Atlanta, GA, on May 8th is Judith R. Ragsdale, Director of Education and Research in Pastoral Care at Cincinnati Children's Hospital Medical Center. The honor recognizes her overall and increasing body of work and particularly a recent study on "Behaviors ACPE Certification Commissioners Seek from Associate Supervisory Aspirants: a Qualitative Research Study." Dr. Ragsdale was part of a research team of ACPE Supervisors including Sheryl Lyndes Stowman, Johnny Bush, Rodney Seeger, and Charles Orme-Rogers. They investigated what behaviors ACPE Certification Commissioners described as influential in voting to grant or deny certification to a candidate seeking supervisory status. Over 20 Certification Commission members participated in interviews, which were transcribed and analyzed by grounded theory methodology. Ragsdale, J. R. "Critically engaging 'Mutually Engaged Supervisory Processes' -- a response." Journal of Pastoral Care & Counseling 68, no. 4 (2014): 6:1-4 [electronic journal article designation].. This is a response to Fitchett, G., Altenbaumer, M. L., Atta, O. K., Stowman, S. L. and Vlach, K., "Critically engaging 'Mutually Engaged Supervisory Processes': a proposed theory for CPE supervisory education," also published in the same issue of the journal, offering a critique of the 2012 Mutually Engaged Supervisory Processes study. [Abstract:] The Association of Clinical Pastoral Education (ACPE) has a long tradition of rigorous supervisory education. Those entering the supervisory education process will ordinarily hold a master’s degree in theology and will have at least four units of CPE. They must be endorsed or have some manner of stated support from their religious organizations in which they are recognized as professionals in the field of pastoral care. If they are accepted into an education program at a Center accredited to offer Clinical Pastoral Education Supervisory Education, they should expect to spend from 2 to 6 years in the education process. Many will struggle with certification as a pastoral supervisor along the way and others will never be certified. This article is about discerning the vocation to pastoral supervision, specifically in the ACPE, and proposes that the intentional discernment of gifts early in supervisory training will increase the likelihood of a successful completion of the certification process. Ragsdale, J. R., Hegner, M. A., Mueller, M. and Davies, S. "Identifying religious and/or spiritual perspectives of adolescents and young adults receiving blood and marrow transplants: a prospective qualitative study." Biology of Blood & Marrow Transplantation 20, no. 8 (August 2014): 1242-1247. [Abstract:] The potential benefits (or detriments) of religious beliefs in adolescent and young adults (AYA) are poorly understood. Moreover, the literature gives little guidance to health care teams or to chaplains about assessing and addressing the spiritual needs of AYA receiving hematopoietic stem cell transplants (HSCT). We used an institutional review board-approved, prospective, longitudinal study to explore the use of religion and/or spirituality (R/S) in AYA HSCT recipients and to assess changes in belief during the transplantation experience. We used the qualitative methodology, grounded theory, to gather and analyze data. Twelve AYA recipients were interviewed within 100 days of receiving HSCT and 6 participants were interviewed 1 year after HSCT; the other 6 participants died. Results from the first set of interviews identified 5 major themes: using R/S to address questions of "why me?" and "what will happen to me;" believing God has a reason; using faith practices; and benefitting from spiritual support people. The second set of interviews resulted in 4 major themes: believing God chose me; affirming that my life has a purpose; receiving spiritual encouragement; and experiencing strengthened faith. We learned that AYA patients were utilizing R/S far more than we suspected and that rather than losing faith in the process of HSCT, they reported using R/S to cope with illness and HSCT and to understand their lives as having special purpose. Our data, supported by findings of adult R/S studies, suggest that professionally prepared chaplains should be proactive in asking AYA patients about their understanding and use of faith, and the data can actively help members of the treatment team understand how AYA are using R/S to make meaning, address fear, and inform medical decisions. Ragsdale, J. R., Holloway, E. L. and Ivy, S. S. "Educating CPE supervisors: a grounded theory study." The Journal of Pastoral Care & Counseling 63, nos. 3-4 (Fall-Winter 2009): 10-1-14 [online journal article designation]. [Abstract:] This qualitative study was designed to cull the wisdom of CPE supervisors doing especially competent supervisory education and to develop a theory of CPE supervisory education. Grounded theory methodology included interviewing 11 supervisors and coding the data to identify themes. Four primary dimensions emerged along with a reciprocal core dimension, Supervisory Wisdom, which refers to work the supervisors do in terms of their continuing growth and development. Ragsdale, J. R., Steele-Pierce, M. E., Bergeron, C. H. and Scrivener, C. W. "Mutually engaged supervisory processes: a proposed theory for ACPE supervisory education." Journal of Pastoral Care & Counseling 66, nos. 3-4 (Fall-Winter 2012): 3 [electronic journal article designation]. [Abstract:] Nineteen newly certified Association for Clinical Pastoral Education (ACPE) Associate Supervisors were interviewed to determine how they learned to do Clinical Pastoral Education (CPE) supervision. Grounded theory was the qualitative research method used in gathering and analyzing data for this IRB approved study. The emerging theory, Mutually Engaged Supervisory Processes, includes nine processes: Discerning Vocation, Feedback, Support, Supervisory Practices and Identity, Theory, Increased Awareness, Shift in Personhood, Offering Presence, and Owning Authority. Member checks confirmed the trustworthiness of the results. Ragsdale, J. R., Vaughn, L. M. and Klein, M. "Characterizing the adequacy, effectiveness, and barriers related to research mentorship among junior pediatric hospitalists and general pediatricians at a large academic institution." Hospital Pediatrics 4, no. 2 (March 2014): 93-98. [Abstract:] OBJECTIVE: The purpose of this qualitative study was to characterize the adequacy, effectiveness, and barriers related to research mentorship among junior pediatric hospitalists and general pediatricians at a large academic institution. METHODS: Junior faculty and staff physicians in hospital medicine and general pediatrics at a large academic institution were invited to participate in this qualitative study. In-depth interviews were conducted. Experienced mentors were invited to be interviewed for theoretical sampling. Interviews were conducted and analyzed by using grounded theory methodology. RESULTS: Twenty-six (75%) of the eligible physicians, pediatric hospitalists representing 65% of this sample, agreed to be interviewed about their mentoring experiences. Satisfied and dissatisfied participants expressed similar mentoring themes: acquisition of research skills, academic productivity, and career development. Four experienced mentors were interviewed and provided rationale for mentoring clinicians in research. Both groups of participants agreed that institutional support is vital for promoting mentorship. CONCLUSIONS: Junior pediatric hospitalists and general pediatricians indicated considerable interest in being mentored to learn to do clinical research. Developing faculty and staff physicians to their utmost potential is critical for advancement in academic medicine. Mentoring clinical physicians seeking to add research skills and academic productivity to their practice merits study as an innovative path to develop clinical investigators. Hospital medicine, as a rapidly developing pediatric specialty, is well-positioned to implement the necessary infrastructure to mentor junior faculty in their academic pursuits, thereby optimizing the potential impact for individuals, families, learners, and institutions. Grossoehme, D. H., Cotton, S., Ragsdale, J., Quittner, A. L., McPhail, G. and Seid, M. "'I honestly believe god keeps me healthy so I can take care of my child': parental use of faith related to treatment adherence." Journal of Health Care Chaplaincy 19, no. 2 (2013): 66-78. Grossoehme, D. H., Ragsdale, J., Cotton, S., Wooldridge, J. L., Grimes, L. and Seid, M. "Parents' religious coping styles in the first year after their child's cystic fibrosis diagnosis." Journal of Health Care Chaplaincy 16, nos. 3-4 (2010): 109-122. [Abstract:] Parents of children diagnosed with cystic fibrosis described it as "devastating." Given religion's importance to many Americans, parents may utilize religious coping. Relatively little is known about parents' use of religious coping to handle their child's illness. Interviews with 15 parents about their use of religion in the year following their child's cystic fibrosis diagnosis were coded for religious coping styles. Sixteen styles were identified. Positive religious coping styles were more frequent than negative styles (previously associated with poorer health outcomes), and occurred more frequently than in other studies. Religious coping styles used to make meaning, gain control, or seek comfort/intimacy with God were equally prevalent. The most common styles were: Pleading, Collaboration, Benevolent Religious Reappraisals, and Seeking Spiritual Support. Parents described active rather than passive coping styles. Religious coping involving religious others was rare. Clinical attention to negative religious coping may prevent it becoming chronic and negatively affecting health. Grossoehme, D. H., Ragsdale, J. R., McHenry, C. L., Thurston, C., DeWitt, T. and VandeCreek, L. "Pediatrician characteristics associated with attention to spirituality and religion in clinical practice." Pediatrics 119, no. 1 (January 2007): e117-123. [Abstract:] OBJECTIVE: The literature suggests that a majority of pediatricians believe that spirituality and religion are relevant in clinical practice, but only a minority gives them attention. This project explored this disparity by relating personal/professional characteristics of pediatricians to the frequency with which they give attention to spirituality and religion. METHODS: Pediatricians (N = 737) associated with 3 academic Midwestern pediatric hospitals responded to a survey that requested information concerning the frequency with which they (1) talked with patients/families about their spiritual and religious concerns and (2) participated with them in spiritual or religious practices (eg, prayer). The associations between these data and 10 personal and professional characteristics were examined. RESULTS: The results demonstrated the disparity, and the analysis identified 9 pediatrician characteristics that were significantly associated with more frequently talking with patients/families about their spiritual and religious concerns. The characteristics included increased age; a Christian religious heritage; self-description as religious; self-description as spiritual; the importance of one's own spirituality and religion in clinical practice; the belief that the spirituality and religion of patients/families are relevant in clinical practice; formal instruction concerning the role of spirituality and religion in health care; relative comfort asking about beliefs; and relative comfort asking about practices. All of these characteristics except pediatrician age were also significantly associated with the increased frequency of participation in spiritual and religious practices with patients/families. CONCLUSIONS: Attention to spiritual and religious concerns and practices are associated with a web of personal and professional pediatrician characteristics. Some characteristics pertain to the physician's personal investment in spirituality and religion in their own lives, and others include being uncomfortable with spiritual and religious concerns and practices. These associations shed light on the disparity between acknowledged spirituality and religion relevancy and inattention to it in clinical practice. Grossoehme, D. H., Ragsdale, J. R., Snow, A. and Seid, M. "We were chosen as a family: parents' evolving use of religion when their child has cystic fibrosis." Journal of Religion & Health 51, no. 4 (December 2012): 1347-1358. [Abstract:] Parental coping with new CF diagnoses often includes religion; however, little is known about how the use of religion changes over time. Longitudinal grounded theory method, in which parents were interviewed twice the 2 years after their child's diagnosis, was used. Parents constructed the meaning that parenting a child with CF is their vocation, in accordance with "God's plan." A shift from isolation to an outward focus and reentry into the community was clear. The use of faith evolved over time and continues to be a source of support and hope for parents. Clinical implications of parental religion are discussed. Grossoehme, D. H., VanDyke, R., Jacobson, C. J., Cotton, S., Ragsdale, J. R., and Seid, M. "Written prayers in a pediatric hospital: linguistic analysis." Psychology of Religion & Spirituality 2, no. 4 (November 2010): 227-233. [Abstract:] Previous research suggests that written prayers have linguistic characteristics similar to written emotional self-disclosures, and may also confer their health benefits. This study's aim was to test that hypothesis in a clinical setting; a secondary aim was analysis of prayer content. Written prayers in a pediatric hospital chapel were collected (N = 800). Linguistic analysis provided the percentages of word types previously associated with health benefits. Prayers written in this clinical setting do not share linguistic characteristics of written emotional disclosures. These petitionary/intercessory prayers have a significant amount of positive emotion words; more words of causality than insight; and are frequently specific about desired outcomes. The prayer language suggests that the writers expect some result from the Deity or other readers of the prayer book. Prayers written in pediatric and adult settings differ in some respects. Clinical implications and future directions are discussed. Grossoehme, D. H., Ragsdale, J. R., Cotton, S., Meyers, M. A., Clancy, J. P., Seid, M. and Joseph, P. M. "Using spirituality after an adult CF diagnosis: cognitive reframing and adherence motivation." Journal of Health Care Chaplaincy 18, no. 3-4 (2012): 110-120. [Abstract:] Chronic illness is a significant stressor; the majority of Americans cope utilizing spirituality. Numerous studies demonstrate links between spiritual coping and health outcomes. The purpose of this study was to determine whether persons diagnosed with cystic fibrosis (CF) as adults use spirituality to cope and influence disease management. Semi-structured interviews were completed and analyzed using grounded theory. Data saturation was reached following twelve interviews (83% female); representing 100% participation of those approached and 48% of eligible adults. Persons with late-life CF diagnoses used spirituality to make meaning, understanding themselves in a collaborative partnership with their pulmonologist and God. Supporting themes were: (a) God's intervention depended on treatment adherence and (b) spiritual meaning was constructed through positively reframing their experience. The constructed meaning differed from that of adult parents of children with CF. Late-life diagnosed adults focused on personal responsibility for health. Clinical and research implications for chaplains are presented. Grossoehme, D. H., Ragsdale, J., Wooldridge, J. L., Cotton, S. and Seid, M. "’We can handle this’: parents' use of religion in the first year following their child's diagnosis with cystic fibrosis." Journal of Health Care Chaplaincy 16, nos. 3-4 (2010): 95-108. [Abstract:] The diagnosis of a child's life-shortening disease leads many American parents to utilize religious beliefs. Models relating religious constructs to health have been proposed. Still lacking are inductive models based on parent experience. The specific aims of this study were: 1. develop a grounded theory of parental use of religion in the year after diagnosis; 2. describe whether parents understand a relationship between their religious beliefs and their follow-through with their child's at-home treatment regimen. Fifteen parent interviews were analyzed using grounded theory method. Parents used religion to make meaning of their child's cystic fibrosis (CF) diagnosis. Parents imagined God as active, benevolent, and interventionist; found hope in their beliefs; felt supported by God; and related religion to their motivation to adhere to their child's treatment plan. Religious beliefs are clinically significant in working with many parents of children recently diagnosed with CF. Interventions that improve adherence to treatment may be enhanced by including religious aspects. I began a process of discovery after a number of ACPE emails and other communications in early 2014, related to decisions by the ACPE Board of Representatives and President to innovate the process of how we certify supervisors. The rationale for change focused upon our need to respond to the number of persons in the certification process who seemed to be leaving due to difficulty in matriculating, along with a need to change and streamline our processes in a similar fashion to the actions of the Association of Professional Chaplains in recent years. In light of the turn of events, I became interested in collecting data on the numbers of certifications and available positions. First, I contacted the ACPE national office for the numbers of persons certified by year and the gap between those certified as Associate or "acting" and then those fully certified. 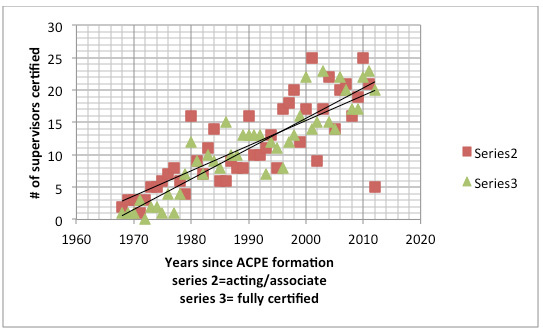 I received raw data on this in late February 2014 (noted in Figure 4, below), which demonstrated that the ACPE increased the numbers of certified supervisors steadily from 1968 through 2012 (the date of the most current data available). I next sought information about chaplaincy positions, as this seemed related, indirectly, to broad concerns in the ACPE. As a CPE Supervisor since 1982, I have attempted to be diligent in keeping accurate information about positions for chaplains in the regional and immediate areas in which I had worked, and in recent years I also made use of dedicated search engines for jobs in order to get a better sense of the market. After moving to the VA in Portland, Oregon in 2012 I began to notice that most advertisements for chaplain positions were for PRN positions, and the majority of those were in the area of hospice care. Full time positions for chaplains in medical centers appeared to be few and far between. I was moved to develop an electronic survey of APC/ACPE members to collect new data, which I did in consultation with the ACPE national office. This survey was "owned" by the ACPE and provided to the APC for use and distribution through organizational newsletters. I present here some of the results, as so far analyzed, and preliminary thoughts. I am still working with the survey data in terms of possible relationships to the job market and to the process of becoming an ACPE supervisor. Figure 1 notes the identities of those who responded. 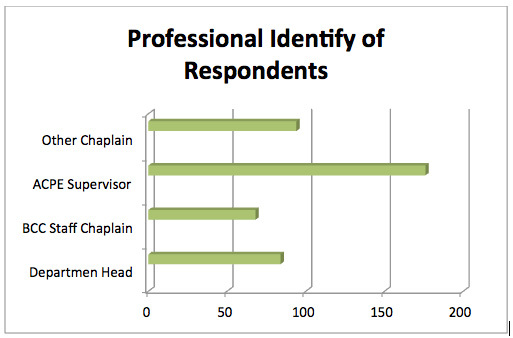 There is some duplication of respondents, in that some department heads are both CPE Supervisors and APC Board Certified Chaplains. From 341 responses, 98 full time positions were reported to have been funded over the past three years (excluding part time and temporary positions, and centers indicating over 10 positions). From 242 responses, 197 temporary positions were reported to have been funded over the past three years. From 247 responses, 28 positions were reported to have been backfilling due to retirements or death. In the past three years, how many positions have you been able to fill? From 205 responses, 196 positions were reported to have been filled. In the past three years, how many CPE Supervisor positions have you been able to fill? From 142 responses, 34 CPE Supervisor positions were reported to have been filled. Regarding the above findings: All partial totals were omitted. Narrative responses which were not clearly stated as a number were excluded (e.g., “all of them” was a frequent response). Also, answers which indicated over 10 positions were omitted. Several responses stated 11-16 positions, and these high numbers were questionable and suggested that respondents were including CPE student positions. There is some robustness in newly funded chaplain positions, with the total of temporary and permanent positions approaching 300 in this sample. The number of supervisors hired over the past year was reported to be 34. This number may have been included in the number of permanent positions funded. The number of vacancies due to retirement or death was 28. This number, if added with the newly funded positions, increases the overall number of vacancies to 323 in this sample. An interesting comparison lies in connection with the number of positions that were reported to have been filled: 196. It appears that there are growing numbers of chaplain positions which are beyond that of “flat line hires” (i.e., when a chaplain leaves a chaplain is replaced). It seem to be more temporary and permanent being funded that those leaving. Figure 3 highlights a surprising finding, vis-à-vis anecdotal evidence. The number of new positions (not backfilled from retirements or deaths) exceeded the number of temporary positions. I personally expected this to be just the opposite and not nearly so close in numbers. These positions are for staff chaplain and CPE Supervisory positions and include both full and part time. They do not include CPE residency positions at any level. I place these numbers into the context of the raw data on certifications that I received from the ACPE national office in February 2014, showing the number of "acting"/Associate Supervisors certified by year from 1968 until the winter of 2012. It also included the numbers of fully certified Supervisors by year during the same time period. Both sets indicated a steady increase in the number of certified supervisors, with a significant leap during the years when the ACPE went from "acting" status to Associate status. Figure 4 is a line graph showing the progression without the actual numbers embedded. 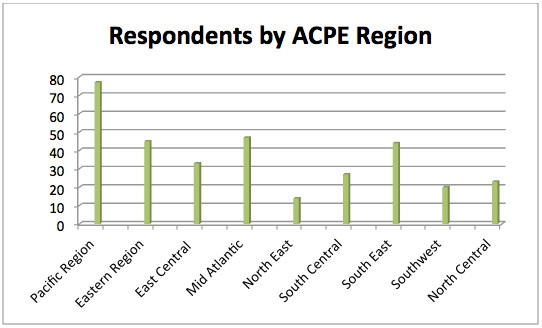 Figure 4 indicates that the ACPE has had a steady growth in supervisory numbers through the years reported. I would conjecture that our "aging" workforce has been fairly steady as well, but that is a point for further research. Data from the survey is still being analyzed. For more information, readers may contact me at thomas.phillips@va.gov. The Pastoral Caregiver's Casebook series, four volumes edited by ACPE Supervisor (retired) John J. Gleason, DMin, is now available for order from Judson Press and book retailers. Judson Press has issued a special flyer. The books grew out of the project encouraged by our Network from 2006-2012: the Spiritual Care Initiative for Professional Excellence (SCIPE). This resource gives real-world examples of ministry with practical value for clinical chaplains as well as congregational clergy. However, inasmuch as original project inductively developed a Knowledge Base of Spiritual Care Samples from CPE students and trained pastoral practitioners, the books offer a revealing picture of what chaplains today consider "best practices." They are relevant, therefore, to research aimed at advancing pastoral practice and developing evidence-based interventions linked to identifiable outcomes. In total the series presents 330 cases, each with a critique and highlighting that indicates effectiveness. This publication is an example of how our Network can help facilitate creative work within the ACPE. The volumes not only drew from CPE sources but now hold good potential for use in CPE curricula, to supplement student verbatim exercises in the discussion of pastoral encounters. John J. Gleason has been a long-standing member of the Network and a strong voice for research within the ACPE. He may be contacted at MARIEJOHN50@ATT.NET. For the twelfth year, the Duke Center for Spirituality, Theology and Health, in Durham, NC, will hold its five-day research-oriented summer workshop, August 10-14, 2015, hosted by Dr. Harold G. Koenig. The event is recognized by the Association of Professional Chaplains (APC) as an educational event providing 30.5 hours of continuing education that can be applied to the educational hours required by the Board of Chaplaincy Certification, Inc. Tuition discounts are available. Enrollment will be limited. Network members may be especially interested in the workshop's recommended preparatory reading list, available as a PDF by clicking HERE. Applications are being accepted until April 17, 2015 for the David B. Larson Fellowship in Health and Spirituality by the John W. Kluge Center at the Library of Congress. This stipended ($4,200/month), full-time residency opportunity is open to U.S. citizens or permanent residents who hold a doctoral degree. Detailed information is available at www.loc.gov/loc/kluge/fellowships/larson.html. Dr. David Larson was a key figure in spirituality and health research and in the integration on spirituality into the modern medical dialogue. This fellowship "encourage[s] the pursuit of scholarly excellence in the scientific study of the relation of religiousness and spirituality to physical, mental, and social health" [--from the Kluge Center announcement]. In addition to the resource of the scholarship web page, questions may be addressed to Jason Steinhauer, Program Specialist, Office of Scholarly Programs, Library of Congress at jste@loc.gov or 202-707-0213. Chaplain Austine Duru, Director of Mission and Pastoral Care at St. Elizabeth Regional Medical Center & Nebraska Heart Hospital in Lincoln, Nebraska has written in Vision [vol. 25, no. 1 (January-February 2015): 7-8] about the National Association of Catholic Chaplains’ approval of revised standards that require a research competency for certification. In "Standards call for research-informed co-workers," Chaplain Duru notes that the new standard "serves a dual purpose"
305.7 [for general certification]: Articulate how primary research and research literature inform the profession of chaplaincy and one’s spiritual care practice. 604.2 [for specialty certification in palliative care and hospice]: Keep current and participate in evidence-based, research-informed best practices in chaplaincy and spiritual care. 604.3 [for specialty certification in palliative care and hospice]: Integrate chaplaincy care into the organization through appropriate measures, such as policies and procedures, use of evidence-informed spiritual screening, history taking, assessment and documentation processes and education of the interdisciplinary team about the role of the professional chaplain. The full January-February 2015 issue of Vision may be downloaded from the NACC website. Health care chaplains are embracing the importance of evidence-based chaplaincy care. In his presentation, George Fitchett, a leading chaplain-researcher, will review what evidence-based care is and is not and will examine the case for and against it. He will illustrate how different types of research can inform chaplaincy practice and discuss the implications of this paradigm change for the profession of health care chaplaincy. Description: This workshop is designed to teach participants fundamental research methods. It will include an overview of literature supporting research design, as well as discussion of data collection techniques, and issues to consider in data analysis. Participants will discuss pros and cons of quantitative, qualitative and mixed methods designs, with special attention paid to spiritual and psychological care applications. Examples of health service research from the National Health Interview Survey, as well as cohort and case study presentations will demonstrate different types of research questions. Description: This hands-on workshop will focus, build-up, and apply features described in three previous APC professional writing workshops. Participants will utilize a topic of their choosing to write about and learn how to select the model, format, and style consistent with what they wish to convey and how they wish to present it. Varieties of conducting, recording, and writing-up research for professional publication will be presented. Participants will submit their written work to peer-participants for review and critique and, in turn, will learn how to conduct and provide critique to peer-participants. Description: As the demographics of our population steadily age and increase in numbers, we are learning more about the needs and strengths of these age groups. Workshop participants will learn about current research regarding life changes of elders in their 70’s, 80’s, and 90’s. They will review developmental and aging theories that help them understand and minister with elders, while distinguishing between a theology of servant ministry and a ministry of mutuality and befriending . Participants will reflect upon their ministries with elders, and integrate research about aging, and how theory can inform theology and practice of ministry. Description: This workshop will lead the participant through a series of steps to assist with their engagement in the research process. The participant is encouraged to bring a research question that applies to their work place and chaplain work to the session. They will be guided through a series of steps (question evaluation, research method determination, research methodology execution, research evaluation, research result implementation, evaluation of research implementation) with reference materials and examples being provided for each step. It is the intent of the workshop for each participant to leave with a skeleton plan for completing a research project. Description: Tami Briggs, Therapeutic Harpist, and Barbara Schommer, Healing Touch Instructor, have been working together at the hospital bedside since 2006. In this experiential session, Tami will summarize the findings of a leading-edge research study that examines the concomitant use of these two modalities to reduce pain, anxiety and nausea in the post-operative hospital patient population. She will share some of the spiritual anecdotal stories, as well as play live harp selections that relate to the findings and the patients' vignettes. Description: This study examined the effects of a forgiveness education intervention on the psychological well-being of clergy and their ability to apply interpersonal forgiveness skills in conflict situations depicted in hypothetical vignettes. A sample of 32 clergy from eleven different denominations was randomly assigned to either an experimental or control group. The experimental group received a four session forgiveness education intervention while the control group was taught human relation skills. Statistically significant results were found between the experimental and control groups in regards to the participants willingness to forgive and the use of forgiveness strategies for resolving the interpersonal conflict situations. Description: Over the past five years, the VA Mental Health and Chaplaincy Program has engaged patients, providers, and policy makers in multiple research and evaluation projects. Findings from these projects have been published in numerous journals and resulted in substantial additional support for integrating mental health and chaplaincy services. This workshop will present select findings from these projects in order to illuminate how mixed methods quantitative/qualitative approaches have helped to honor the complexities of chaplaincy research, how chaplains have been fruitfully involved in different phases of research, and how findings have contributed to the implementation of an ongoing online instructional program. Description: This workshop intends to provide experience with basic tables in research articles so that readers will not just run away from data. Critical reading of research includes examining the characteristics of the sample. By looking at tables from three different articles, the session will discuss the impact of the sample on deciding whether or not the results are "true." Research usually explores the relationship of tow factors, like patient satisfaction and chaplain intervention. The workshop will also address some of the different statistical methods for associations. The attendee will have to be willing to do a bit of head work, but the presentation is user friendly. The presenter has been preparing Cliff Notes for the Webinars by Fitchett and Murphy for several years. Description: Palliative Care is a rapidly emerging field in health care; however, research has not been done to describe and define the work of palliative care chaplains. This 90-minute workshop will begin to define the current state of Palliative Care Chaplaincy in America. The workshop will introduce Palliative Care as well as the results from a national survey of hospital chaplains working with Palliative Care patients and their loved. The survey results will describe palliative care chaplains' practices, involvement in the palliative care program, as well as their stressors and self-care practices. The workshop will also include case presentations that highlight the work of Palliative Care Chaplains in a variety of settings. Time will also be spent to introduce and spotlight several palliative care chaplains and their work. Please note, the Rev. Jeuland is the Principal Investigator and Dr. Fitchett is a consultant for this research project. Description: This workshop describes how the chaplains of Saint Thomas Health developed a tool to effectively identify patients in need of spiritual intervention as well as meet the 2015 NCCN guidelines to screen patients for distress. The process includes the creation and implementation of a research study to validate the screening tool. The spiritual distress screening tool, designed for use in an electronic charting system, can be easily administered by physicians and nurses when screening a variety of patients in both the inpatient and outpatient settings. Description: The research was conducted as part of my doctoral project. I conducted before and after surveys of baby boomers who attended a 6 week (18 hour) course on spirituality in transition to retirement. Evaluative questions addressed three areas: 1. level of spiritual awareness, 2. Expectations of Retirement and Living in the Third age, and 3. Integration of Spirituality in Third Age Planning. In this workshop, I will share the process of developing and implementing a research project, from the early steps of establishing a research question to the design and implementation of the research. Finally, we will look at how the data was evaluated. Description: A comprehensive model of spiritual care is an interconnected progression of outcomes, interventions, assessment, history-taking, and screening and must be patient-centered EBP compatible with health care needs and expectations. This workshop explores some of the current literature that would influence development and implementation of such a model and is based on the literature review in the presenter's PhD dissertation. Description: In Palliative Care, having a human connection with the patient is considered to be an important aspect of care. We sought to develop and validate a measure of therapeutic alliance between patients and their palliative care practitioners, and to evaluate the effects of that therapeutic alliance on experiences and care. The Chaplain, as a palliative care specialist, can lead the therapeutic alliance that is so important in establishing a bond with the patient. This workshop will sample how research and practice blend to obtain the outcome of therapeutic relationship in palliative care. Description: To provide an introduction and brief overview of some of the best research in chaplaincy published in the previous year to make current, excellent research more accessible to professional chaplains. Description: This workshop will provide participants with an opportunity to create a list of tools, resources and research methods for transforming and sustaining communities through human wholeness and corporate wellbeing. Utilizing the theme of "Living in a Paradigm Shift of Care" participants will engage in discussions and activities to encourage critical thinking towards deepening and broadening the role of the chaplain as it relates to developing an interdisciplinary model of care in the corporate world. Description: The Advocate Health Care chaplaincy research which produced a methodologically based Taxonomy of Chaplaincy activities (a normative inventory of interventions, methods, and intended effects) has been used by numerous chaplains across several health care systems. This workshop shares trends in the use of the taxonomy by chaplains. It also provides the opportunity for participants to develop their own Spiritual Care Plans based upon Spiritual Care encounters. Finally, the workshop offers a resource for chaplains to use to share with administration on the contributions and impacts of chaplains as a member of the interdisciplinary team. Full information about the conference is available at www.professionalchaplains.org.